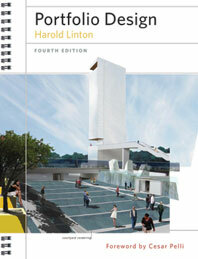 Harold Linton’s Portfolio Design has been the standard reference for students and young professionals in architecture, urban planning, landscape, and interior design who want to make the best impression possible in their applications for undergraduate and graduate school admissions, design grants, competitions, or in a job interview. Now, with the fourth edition, the book is better than ever. All the features that made Portfolio Design the go-to guide—how to assemble a portfolio that will display your talents and qualifications to the best advantage; advice on formats, content, sequencing, page layout design, and binding systems; when to print and when to go digital; and the latest in promoting yourself on the Internet—are still there and updated. The portfolio examples are new and more numerous than ever (more than 400 portfolio pages displayed), and all in color. Drawn from a wide array of current student and professional portfolios, both print and electronic, the examples illustrate many and varied graphic design alternatives that demonstrate what will capture the reviewer’s attention—and secure you an offer. While the print portfolio is far from dead, the technology has been revolutionized, so the text now focuses on the new standard operating procedure: portfolios designed and generally produced, sent, and viewed online. Portfolio pointers from industry professionals and educators complement the practical advice given by Harold Linton, who has taught portfolio design to generations of students. As a companion to the print book, an online portfolio showcasing images from the book and bonus portfolio pages is available for browsing at: https://www.wwnorton.com/npb/portfoliodesign.